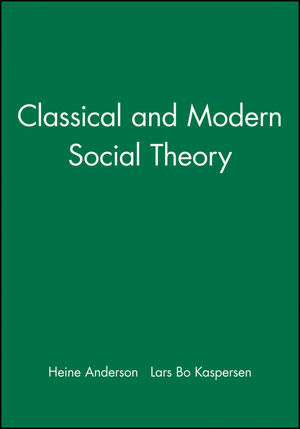 Classical and Modern Social Theory is comprehensive introduction to the field, covering a wide historical range of thinkers, from the classical to the postmodernist, as well as key themes in social theory and a guide to the major debates. Designed for students with little or no background in social theory, this single volume covering both classic and contemporary theory introduces the basic concepts at the center of social theory in accessible language and provides readers with a useful reference source to the field. Heine Andersen is Associate Professor of Sociology at the University of Copenhagen. He was formerly Associate Professor at the Copenhagen Business School and Visiting Scholar at the European University Institute in Florence. Lars Bo Kaspersen is Associate Professor of Sociology at the University of Copenhagen He has been a Visiting Scholar at the University of Southampton and a Fulbright Scholar at the University of California, Santa Barbara. He is the author of Anthony Giddens: An Introduction to a Social Theorist (Blackwell, 2000). 1. Introduction: Classical and Modern Social Theory: William Outhwaite. Part I: Classical Social Theories:. 2. Karl Marx: Per Månson. 3. Herbert Spencer: Heine Andersen. 4. Ferdinand Tönnies: Jorn Falk. 5. Emile Durkheim: Willy Guneriussen. 6. Max Weber: Per Månson. 7. Georg Simmel: Henrik Ornstrup. 8. American Pragmatism: Nils Mortensen. Part II: Modern Social Theories: . 10. The Frankfurt School: Anders Ramsay. 11. Neo-Marxist Theories: Jens Peter Frolund Thomsen and Heine Andersen. 12. Social Interaction Theories: Gorm Harste and Nils Mortensen. 13. Rational Choice: Roar Hagen. 16. Conflict Theory: An Alternative to Functionalism? Pål Strandbakken. 17. Jean-Paul Sartre: Dag Osterberg. 19. Michel Foucault: Sven-Åke Lindgren. 20. Pierre Bourdieu: Staf Callewaert. 21. Jürgen Habermas: Heine Andersen. 22. Niklas Luhmann: Roar Hagen. 23. Norbert Elias: Gunnor Olofsson. 24. Anthony Giddens: Lars Bo Kaspersen. Part III: Contemporary Challenges to Classical and Modern Social Theory: . 25. Post-Industrialization, Cultural Criticism and Risk Society: Gorm Harste. 26. Our Present: Postmodern? Poul Poder Pedersen. 27. Social Theory, Morality, and the Civil Society: Heine Andersen. 28. State, Nation, and National Identity: Uffe Ostergaard. 29. Gender and Society: Karin Widerberg. 30. From Aristotle to Modern Social Theory: Margareta Bertilsson. * Comprehensive and accessible introduction to classical and modern social theory, originally published in Danish. * Contains chapters on both individual thinkers and the key debates. * Textbook features include chapter summaries, comprehensive bibliography to primary and secondary literature, biographical data, lists of key concepts and definition.